Students must registration over the summer and registration closes on July 15. Please watch the Weekly Bulletin for updated information on registration and fees. Whole Community Catechesis regular monthly sessions are based on registration placement and are held from 6:00-8:00 PM in the Auditorium. Updated information including key dates will be provided each year. Seating: Children should sit with their families. There is no assigned seating. Attire: Girls should wear white dresses; veils are optional. Boys should wear a suit, or a jacket and nice pants, along with a dress shirt and tie. Not permitted: Gloves, carrying rosaries, prayer books, flowers, bibles; although you are welcome to bring them with you for your family photos after Mass. Children are warmly invited and encouraged to wear their First Holy Communion attire to weekend Mass any time after their First Holy Communion for as many weeks as they enjoy wearing it. Arrival: Children and their Catechists/Aides should meet in the Auditorium no later than 30 minutes prior to the start of their Mass time in order to line up and process into Mass. Parents are free to drop off their child in the Auditorium, or wait with their child until it is time to line up. Seating: No tickets are provided and Mass is open to everyone. Each family will be assigned one pew on First Holy Communion day. Any family and friends who do not fit in your pew are welcome to sit anywhere else in the church. Pews will have reserved signs with your child’s name on them. Please save the aisle seat for your child(ren) who will be receiving First Holy Communion. Siblings receiving the sacrament will each be assigned their own pew unless you request otherwise in advance. Photography: St. John’s contracts a photographer to take a group photo at the conclusion of Mass. This group photo is courtesy of the parish. Our photographer also takes individual photos of each child as he/she receives Our Lord’s Precious Body. These photos will be available for sale directly from the photographer. Photography Information will be provided as the date gets closer. Out of respect for the solemnity of the Holy Mass, all other photos or videos must be taken from your seat; moving around the church is prohibited. Please accept our appreciation in advance for notifying your extended family and friends of this policy. May Crowning: All First Communicants and at least one parent should attend May Crowning. Refreshments follow. 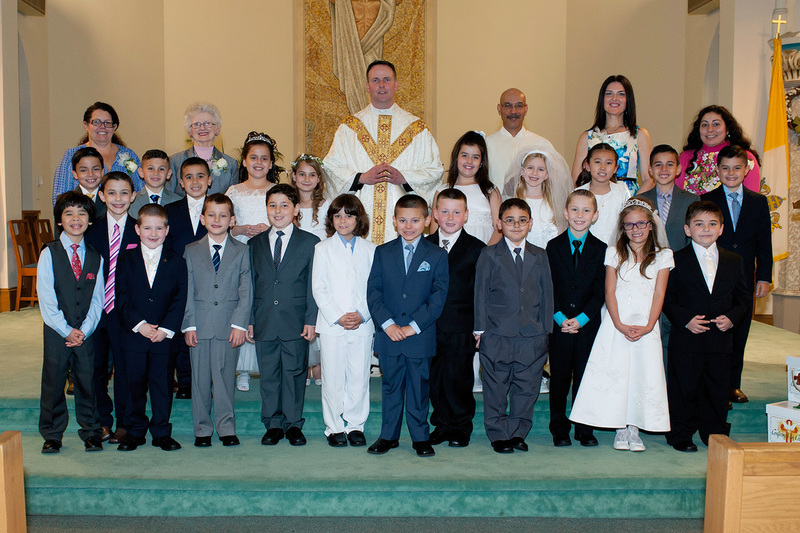 Attire: Children should wear their First Holy Communion Attire. Seating: Children will sit by class in the first two pews. Families should sit anywhere in the church. Arrival: Mass starts promptly at 7:00 PM, however, the Living Rosary takes place at 6:30 PM and you are welcome to participate. If you are attending Mass and May Crowning only, please wait in the vestibule until the Living Rosary is complete. Families will be seated no later than 6:55 PM. Bulletin reflections about First Holy Communion Day will be completed in the Auditorium immediately following this Mass.